Add maida into a food processor bowl. Add salt and carom seeds to maida and give a swirl to mix. Then add oil and swirl the mixture so that oil gets well incorporated into the flour. 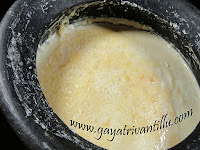 Now add water and make stiff dough like poori dough. Take the dough into a bowl and cover and keep it aside for 15 to 20 minutes. Spread peanuts in a paper plate in single layer. Place the peanuts paper plate in microwave oven and roast on high flame for 2 minutes. Stir once and again roast on high flame for one minute. Stir the peanuts and again roast them on high power for one minute. Allow one minute standing time and remove the peanuts from microwave oven. Take the roasted peanuts into a gunny bag or a cloth bag and bring the ends together and hold it with left hand. Place the bag on platform holding the ends with left hand and rub the bag on the platform with right hand. This way the cover of peanuts separates. Rub the bag for few seconds turning it so as to ensure all the peanuts in the bag are allowed to rub to separate the skins. Now take the rubbed peanuts in a wide plate and separate the skins. Take the measured quantity of roasted peanuts and grind them coarsely in a mixer grinder. Chop dates, cashew nuts and almonds into small pieces. Grind coarsely the fennel seeds and coriander seeds. Take a bowl and add coarsely powdered roasted peanuts, chopped dates, cashew nuts and almonds, ground fennel and coriander seeds mixture, asafetida, red chili powder, salt, garam masala powder, black pepper powder, dried mango powder and sugar powder and mix well. Heat a pan and add oil for deep frying samosas and heat oil on low flame and start making samosas. Spread a paper napkin in a plate and keep it nearby. Take dough and knead well and divide it into small portions (here I have made it into 14 portions). Smoothen each portion of the dough and place it in a bowl and cover it. Take a portion and roll using a rolling pin into oblong shape. Cut the rolled dough in the centre horizontally and get two discs. Take a disc and apply water on the edges. Bring together the flat side edges together and overlap them to get a cone shape. Press lightly to seal the edges. Hold the prepared cone between fingers. Add sufficient quantity of filling. 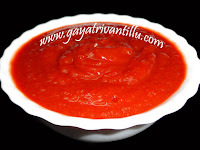 Press the filling with finger and add sufficient quantity. Wet the edged if required. Observe the portion where the edges were sealed to make a cone---opposite to this portion make a pleat by folding the puri slightly. Now fix the entire back portion with front portion and seal the edges by pressing. Seal properly by pressing so that the filling should not come out while frying the samosas. As the edges are wet it would stick easily. This fold allows the samosa to stand when made to. Without making the pleat, stick the edges of the cone together and observe that the samosa would not stand. Hence to make standing samosas make a pleat otherwise one would get sleeping samosas!!! Keep this mini samosa in a plate and cover it with another plate so that it wouldn’t dry till we fry. 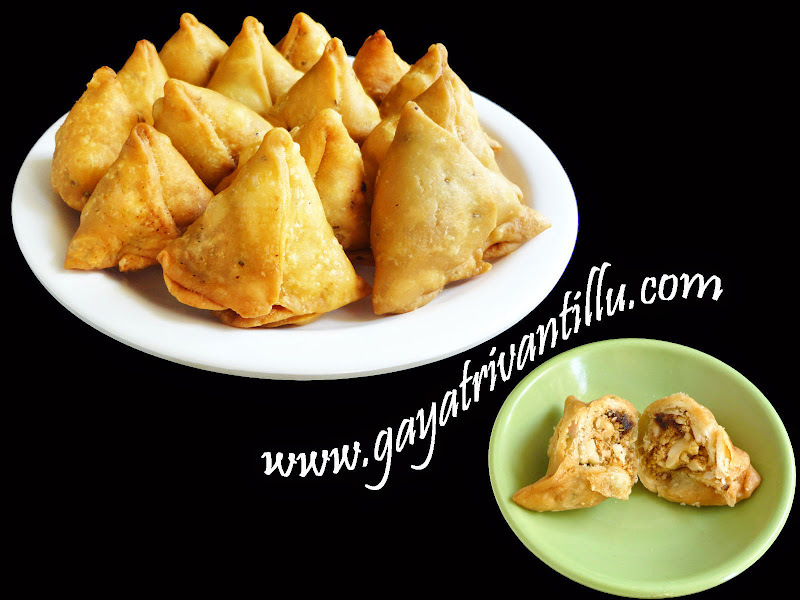 Similarly make few samosas sufficient for a batch of frying and keep them covered. The oil is just hot—neither too hot nor cold. Drop the prepared samosas carefully and fry them on LOW FLAME ONLY. When fried on low flame the samosas get crispier from inside. After few seconds, turn the samosas carefully with a ladle and fry the other side. Fry turning the samosas on low flame till they are slightly crispier and starts changing color. Then increase the flame to medium and fry turning in between. Fry the samosas till they get nice golden brown color. With the help of a slotted ladle carefully remove the samosas from oil and place them on paper napkin to soak excess oil. Now switch off the stove and start making few samosas for next batch of frying. During the process of folding the samosas, the oil gets cooled to sufficient temperature to fry the next batch. After folding few more samosas, switch on the flame and carefully drop the samosas in oil and fry as mentioned above. Make stiff dough as the dough becomes soft after resting. While rolling the dough lift the disc in intervals to maintain the thickness---otherwise the disc may get rolled thin at one point and remains thick at some other point---frying such samosas gets burnt at the thinner edge and doesn’t get cooked at the thicker edge. So maintain even thickness---check this by running fingers on the rolled portion to have a feel of it. While folding the samosas if we give a pleat to it, it stands otherwise it sleeps---taste wise no difference. Remember not to overheat the oil. Always fry samosas on low heat only and once they are somewhat crisp fry them on medium heat till golden brown in color. When fried on medium or high heat the samosas get browned and crisp fast but they would remain under cooked from inside which would make them soggy on cooling. When you see tiny bubbles on the surface of the samosa after frying for few seconds, it indicates that the oil is too hot. The surface of the samosa should be smooth after it is fried---this texture comes when samosas are fried on very low heat. When fried on very low heat they get fried from inside too and become crispier. Such samosas stay crispier for long period. After frying the first batch of samosas, switch off the flame and cool the oil to required temperature before adding another batch of samosas. The filling has sweet, sour and spicy flavors in right measurements---hence these mini samosas taste yummy when served in parties or get-togethers. Make these tasty sweet and sour mini samosas during festivals. They can be made in advance and they keep fresh for long time. They can also be served as travel treats.